Join Facebook groups such as the Doctor of Physical Therapy Students group. Then jump into a conversation, start a discussion or ask questions. Not only are there tons of students in the group but there are also seasoned PTs there who have been in your shoes once and want to help! Have an updated LinkedIn page! Do not neglect LinkedIn. This is THE professional social media platform. Just because you are a student does not mean you don’t have life and work experience. This should all be on your profile along with a clear professional looking picture. Make sure you keep updating your LinkedIn profile after each semester, clinical rotation, cont ed course, etc. This is where potential employers are looking for that one perfect candidate….and it might be you! Video is all the rage at the moment. So consider joining Periscope or broadcasting some Facebook Live posts. Think about the valuable content you have to share. Maybe you had an experience in class or at a clinical rotation that you think others can learn from. If so get it out there to the world! 2. Pitch yourself to a PT related podcast (there are tons of them). Tell the host how much you liked one or more of their podcasts. This shows that you actually do listen to the podcasts and you know what the show is about. And it makes the host feel pretty good! List at least 2-3 topics you would like to talk about on the podcast and why. Be sure to list your contact information including all of your social media outlets. Finally thank the host for their time. If you have not heard back from the podcast host in a week or so send a friendly follow up email. Don’t forget that everyone has a unique experience, story or outlook that the world is waiting to hear! You don’t have to start your own blog as that can be quite time consuming, but you can pitch your blog ideas (to be a guest blogger) to existing blogs by following the steps outlined in pitching a podcast. The main different here is you might want to include some samples of your writing so the blogger gets an idea of your style and can then decide if you would be a fit for their blog. 4. Take continuing education courses as a student. Contact the speakers or organizations that run the courses you are really interested in and ask them if they need volunteers to help the course run smoothly. Offer to check people in, set up/clean up before and after the course, help with audio/visual needs, assist the speaker with whatever they need, etc. in exchange for attending the course for free or a highly discounted rate. Will this approach work every time? Probably not…. but if you never ask the question the answer will always be no! Not only does this show that you are interested in furthering your education but it also shows that you are a go getter and are not afraid to take action! 5. Become a student member of the APTA and get involved in the Student Assembly. This is something I wish I did when I was a student and I really regret not doing so. Being a student member of the APTA has lots of perks like discounts on continuing education and large conferences. And if you can swing it I highly recommend going to the larger conferences like CSM and NEXT. You will meet tons of PTs, join in conversations outside of the formal classes (this is where all the best convo happen anyway) and you can meet your social media pals in real life. Again, I know this is an expense but I think it is well worth it if you want to be known as a standout #DPTStudent. Most of the actions on this list are free and will only cost you a few hours a week. So now what?? It is time to take action!! This week I would love for you to action on one of the following suggestions below. *If you are not on social media get on it! If you are, start being more social! *Make a list of podcasts and/or blogs you would like to contribute to. *Write out your email pitch for podcasts and blogs (be sure to include all of your credentials). *Get clear on what aspects of the physical therapy world you are most interested in and compile a list of continuing education courses that appeal to you! 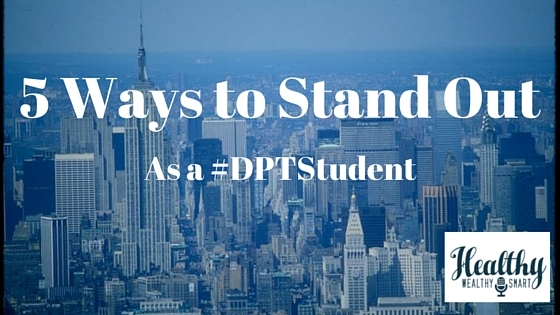 I am sure there are a number of other ways you can stand out as a #DPTStudent. If you have any suggestions I would love to hear them. Please leave them in the comment section below. Or you can find me on Twitter here and on Facebook here. Let’s keep the conversation going! P.S. Don’t forget to subscribe to the podcast on iTunes! And I would be ever so grateful if you left a rating and a review here. This is very helpful! Thanks for making it. I know it’s a different topic, but do you have any advice for how to stand out as a potential DPT student for someone who’s still an undergrad? Great question. If you are still an undergrad and want to stand out even before you get to a DPT program I would say to volunteer at a PT clinic, get on to Twitter and seek out other PTs and don’t be afraid to ask questions on what it takes to get into a program, and I would even reach out to programs you are interested in and try to speak to some professors or students in the program.